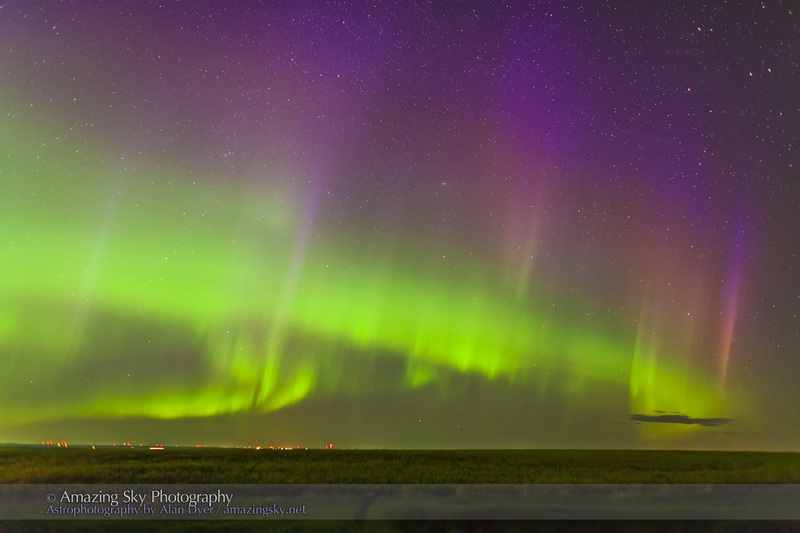 Curtains of purple and pink top the usual green bands of aurora. The last couple of nights have been very clear and filled with aurora. Two nights ago, July 9, the sky really let loose for a good display showing a great range of colours. 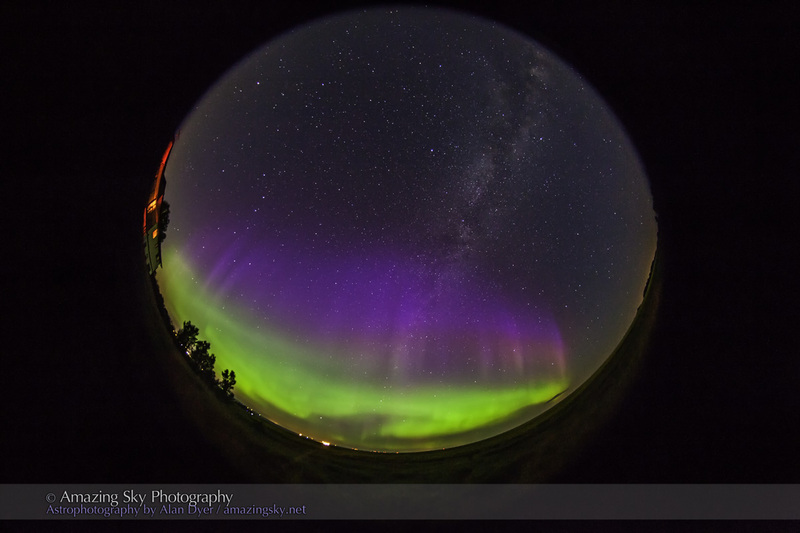 Only the green was readily visible to the naked eye, but the cameras picked up the fainter bands of purple and magenta. Most of the colours here come from oxygen atoms glowing. But high up, in the near vacuum of space, oxygen can glow red. The curtains can also be lit by sunlight coming over the pole, lending a blue tint to the aurora. The two colours blend to give purple. Lower down in the atmosphere, green lines from oxygen predominate. When an aurora is very energetic, the incoming electrons can trigger nitrogen lower in the atmosphere to glow red and pink, giving the curtains a red fringe on the lower edge. That didn’t happen this night. 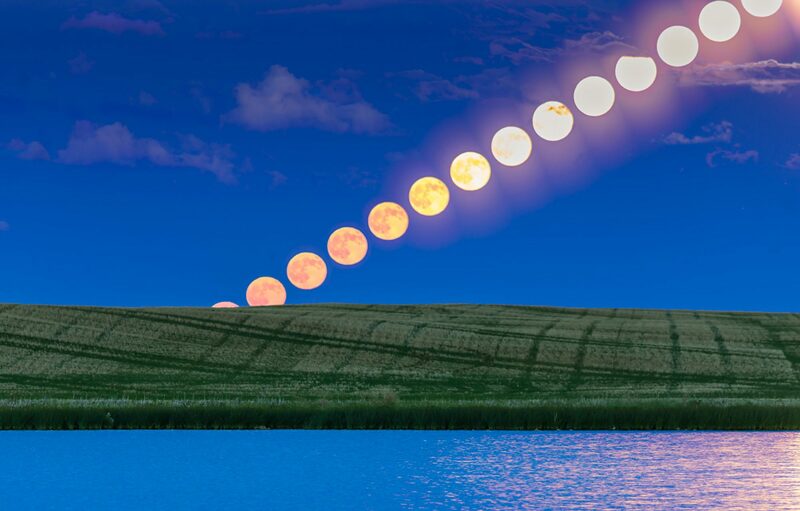 This fish-eye shot of the entire sky shows the high purple curtains arching up the sky. Over several minutes they separated and ascended away from the main green band, shooting up the sky. It seemed as if they were their own curtains and not just a different coloration fringing the main display. The Northern Lights have been active lately so keep an eye on Spaceweather.com and AuroraWatch for alerts and warnings. Alan, may I use this (or perhaps one of your other aurora images) for the cover photo for one of my Facebook Pages – http://www.facebook.com/escapetoalberta. I will of course attribute the photo. Hi Ann – Yes, you may use one of my photos for your Facebook page, with provided it has the watermark and with credit supplied. Thanks for asking! Yes, you may reblog this. No problem. Thanks! Gorgeous, as always. Thanks for the lovely photos. It reminds me of the 3 years I lived on the prairies under the aurora.